Imagine you’re working out with friends at the gym and you all want to listen to a song, but only one person has it downloaded. Not a problem: Beaming the song from one smartphone to any number of other devices is a little easier now with a new app. Mobile music sharing services are not exactly a new thing, but Speakerfy, which officially launches Tuesday, offers a service that its developers claim the competition doesn’t offer: music syncing that is truly social. Other players in the space, such as PairShare and MyStream, only work on iOS devices, which is their biggest problem, according to Optini, the company that developed Speakerfy. Optini, which plans to introduce other social apps in the coming months, wants to make music syncing more social through a combination of quirky sharing features and cross-connectivity between platforms. 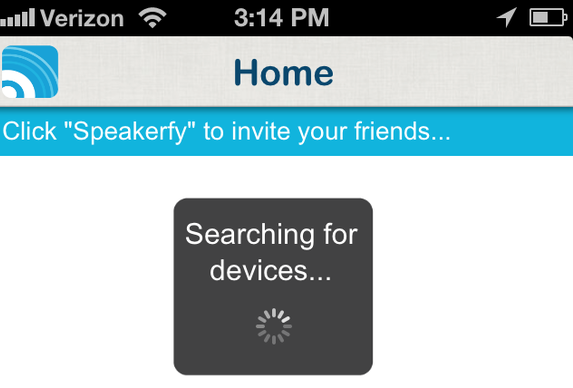 Speakerfy searches for nearby users over Bluetooth and Wi-Fi. Speakerfy, however, is not quite there yet. At the moment it is only available on mobile iOS devices such as the iPhone, iPad and iPod touch. Its makers plan to launch Android and Windows versions in the coming months. Here’s how the app works: Users can choose between a free, ad-supported version and a US$0.99 version without ads. Both versions work the same way. After the app is opened, it searches for other devices on the same Bluetooth or Wi-Fi network that have also downloaded it. 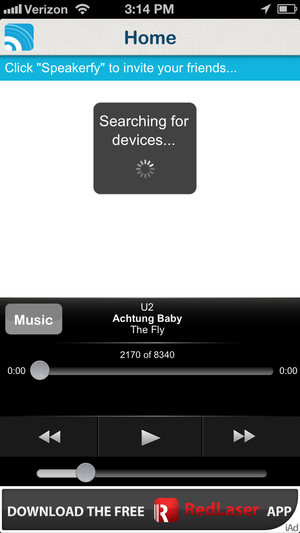 The user can then tap a button to invite those other devices, and start beaming songs from a library or custom playlist. If the connection is made over Bluetooth, only two devices can be synced together, but over Wi-Fi, there is no limit. One particularly social use of the technology could be to facilitate large, party-like gatherings, or “mini-concerts,” in otherwise non-musical places, its developers say. Parking lots or garages where there aren’t other suitable speakers or stereo systems available, for example, could be prime contenders, they said. Future versions of the app will also include more sharing features, such as a digital jukebox mode for playing songs over the sound system of a restaurant or store that allows it, and a DJ mode to give one person complete control of the music selection among many listeners. The app attracted some buzz at this year’s South by Southwest Interactive festival in Austin, Texas, where it was one of two products to be recognized by retired pro basketball player Shaquille O’Neal as a winner of the “Pitch Shaq” competition. Beam, a talking monitor on wheels for videoconferencing, was the other winner. Speakerfy underwent a soft rollout at SXSW, but Tuesday marks its official launch. The self-funded app has 1,700 downloads so far, with roughly 100 downloads a day. The app has gone through three updates since its unveiling at SXSW, but it still has some small kinks. When scrolling through song titles within albums, for example, selecting the last track is nearly impossible in some cases because the track list has a tendency to snap upwards from the bottom. The app also does not seem to allow scrubbing forward or backward within a song, and the opening track on every album appears to be listed as the second song, even though it is the first. User interface improvements will be continually rolled out in the months to come, Wright said.